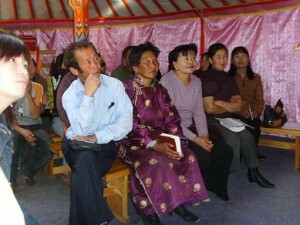 The Mongolians living in Northern Asia are an unreached people group. There are about 7.6 million ethnic Mongolians in Northern Asia. Of those there are estimated to be only about 12,000 believers, which is only 0.16% (1 in 625) of the Mongolian population. Different sources also estimate that 70-80% are without any witness and do not know anything about Father. It is our prayer that these statistics will quickly change for the better! Mongolians have traditionally been a nomadic culture. They live in a simple round home called a “ger” which can be disassembled and re-built when they move seasonally. Out in the country Mongolians live off the land raising animals such as cattle, horses, sheep, goats, camels, and yaks. They use all these animals for meat, milk, and clothing. In recent days urbanization has brought many Mongolians to large cities where they have been forced to adapt to a very different lifestyle than their ancestors lived. For the most part, however, even urban Mongolians still love the country-side and are still nomadic herdsmen at heart.